Ask Away! with Jeff Smith: The Great 5.3L Truck Swap Debate Revisited! Editor’s Note: The following letter is in response to an answer in a previous column concerning whether to go with a 5.3L LS engine or a larger 350ci small-block Chevy. You can read Jeff’s original answer here. 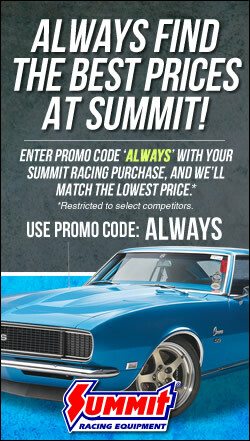 Prices reflect April 2016 figures per Summit Racing and, given the context/purpose of the article, have not been updated. Hey Jeff, I may be a bit old school, but I have built hundreds of motors in my life and I am having a little trouble with the math here. I am looking at the comparison and let’s say we do this crate engine to crate engine. Summit’s 5.3L LS is $3,050, and the 5.7L can be had for $1,709, leaving me with $1,341. Let’s call the intake and carb costs a wash because they are fairly close. Now factor in the cost of fitting the LS into the swap, because with new mounts, hoses, belts, pulleys, exhaust fitment and a host of other things that always pop up in non-direct swaps. I bet a conservative number is close to $500 in extras, so let’s say I only end up $1,850 difference. All us old guys out there know there is no replacement for displacement and that is where my first $900 of the $1,850 will go — to an Eagle 10.5:1 383 stroker kit, a $300 trip to the machine shop to bore and clearance it, and a $50 gasket set. So I’ve got $600 left for the top-end: COMP Cams Magnum top-end kit 230/480 (Summit CCA -K12-213-1) is $336 and a set of Summit roller rockers is $226. So now I have $38 left and GEN 1 high-compression 383 stroker with a much better than stock top end. I have zero fitment issues and I will bet the remaining $38 it will leave the stock LS long block crying at the dyno. Jeff Smith: Karl has put some time into coming up with an alternative, so let’s take a look at this in detail. In my original answer, I said that while it is more expensive to swap in an LS engine into an earlier car or truck, the power numbers support the idea. Karl asserts that he can build a 383 small block Chevy for less than the cost of the new LS crate engine. We’re somewhat at cross purposes here because I was basing my assertion on a used 5.3L engine since they can be obtained for much less than the price of a new small block Chevy crate engine. Before I get into Karl’s engine combination I think it’s important to point out – as I did in the first response – that this is just my opinion. There is no right or wrong answer here. When Karl says “I’m an old school guy” that might mean he has little or no experience with an LS engine – preferring to stick with the traditional small block. That’s perfectly okay. He is certainly not alone. So let’s take a look at his idea. First, I looked up the price of the 5.3L LS motor from Summit Racing (part # 12457705). The price I found was actually lower at $2,986.99 – let’s round it off to $3,000. Karl’s plan is to spend $1,499.99 for the GM Goodwrench 195-horsepower 2-piece rear main seal replacement 350 engine. If I just laid out $1,500 for a brand new engine I wouldn’t immediately tear it apart and put a stroker kit in it. Instead, I would start with decent used engine and I’d go with a one-piece rear main seal engine so I could use a hydraulic roller cam. But let’s stick with his plan. The Eagle Specialty rotating kit is PN B13405E030 and includes a crank, rods, pistons, rings, bearings, a balancer and flexplate all for $749.97 – that’s a good deal. This kit uses flat-top pistons. Karl contends he can bore and hone it for $300. I’m not sure where he generated his prices but in Los Angeles a proper torque plate honing process will cost around $800. Let’s compromise and say it costs $600. The COMP Cams kit he refers to actually costs $422.97, which is still a really good deal. I found a Summit Racing 1.6:1 roller rocker arm set for less at $199.97. All that plus the $50 for a gasket set comes to more than $3,520 when I add it up, but that’s still not bad money for a complete 383 that’s ready to go. But really you still have to add spark plugs, oil, coolant, and the like. So the money adds up quickly. Karl’s willing to say that the cost of the intake and the carb would be a wash between the two engines, but in reality an LS dual plane intake will cost more — an Edelbrock Performer RPM LS is PN 71187 and runs $316.84 from Summit Racing. Let’s agree that the headers will cost about the same. One thing that will drive up the price for the LS is we would have to purchase the MSD ignition box to control the ignition, which is PN 6010 for the 24x style engines at $321.99. Plus the LS will have to have a custom flexplate and 0.400-inch adapter to mate it to an older style Chevrolet automatic like a TH350 for example. The least-expensive kit is with the Chevrolet flexplate (PN 19260102 $55.99 Summit Racing) and adapter (PN 12563532 $38.99 Summit Racing). The adapter engine mounts will also run a little less than $100. So the cost of the engine (if we start with a new 5.3L) is $3,840 or so and to do the swap including things like spark plugs, coolant, and hoses will be more yet so the 5.3L will be more expensive – assuming we start with a brand new engine. If we go with a used engine instead, we can save roughly $2,500! I will stand by my statement that the 5.3L motor will make more power than the stock 350 and perhaps make even more peak horsepower than Karl’s 383. The difficulty I see with the 383 plan is it retains the smog-era cast iron heads. Those are frankly some of Chevrolet’s least impressive castings in terms of airflow. He also overlooked the fact that the cam and 1.6:1 rockers will kick up the lift to 0.530-inch and that $150 worth of machine work will be necessary to keep the retainers from bottoming against the valve guide seals. The intake ports flow barely 200 cfm at a peak valve lift of 0.500 compared to the smallest valves in LS cathedral ports that will flow 220 to 230 cfm at peak. Plus, the LS has a much better combustion chamber that requires far less ignition timing to make best power. What few people realize is that the exhaust port is as much responsible for good horsepower numbers as the intake port. Here is where the stock iron small block heads really suffer. I don’t have specific exhaust flow numbers for that stock head, but it’s about 145 to maybe 150 cfm. The stock 5.3L cathedral port will flow 185 to 190 cfm. That’s a huge difference. Still want to put stock iron heads on a 383? It will be choked above 5,000 rpm. Realistic horsepower numbers for a 383 with these stock iron heads will be 350 to 360 horsepower, plus you’ve lost low-speed torque with that long-duration camshaft (244/244 degrees at 0.050 with 0.501-inch lift). I built a 383 kit motor just like this with 9.5:1 compression and a 221/ 232 flat tappet cam with Vortec iron heads and it made 375 horsepower at 5,400 rpm and 444 ft.-lbs. of torque at 3,600 rpm. The Vortec heads offer far better intake port flow but still a weak exhaust port as evidenced by the peak horsepower at only 5,400 rpm. So you end up with a fairly lumpy sounding motor that makes no more power than if you’d left it at 350 cubic inches and chose a milder cam. Conversely, the 5.3L motor with a mild 220 degree at 0.050 cam will make 375 horsepower and still have a very decent idle. That’s been proven several times in many magazine stories. One point in the 383’s favor is that even with weak heads, it will make more torque than the 5.3L. Using my 383 that we built when I was at Chevy High Performance magazine, it did make 444 ft.-lbs. of torque at a low rpm of 3,600. That will give it some feel-good throttle response. Factory stock torque specs for a stock 5.3L truck engine is 335 ft.-lbs. of torque. With headers and a carburetor, this might increase slightly to perhaps 375 ft.-lbs., but that it is still much lower than the 383’s 440 ft.-lb. numbers. So perhaps the best way to look at this comparison is that it really comes to down to which engine you think you will be more comfortable driving. Clearly, Karl likes the small block and with a good set of heads (which will cost more), his 383 can make pretty good power. Perhaps a better way to settle this would be to compare the power you can make pitting a used 5.3L LS truck engine against a used 350-cubic-inch small block Chevy where you have a fixed amount of money to spend any way you choose. The test would be overall power — torque and horsepower. That might be a fun comparison!